Upworthy (Part 2) — 88 Million Uniques, But Will This Kill Upworthy? In part one of our look at Upworthy, we identified the keys to their hockey stick growth, which includes an impressive understanding of human psychology, the ability to mine and frame viral content, and the engineering chops to test and iterate toward a user experience that drives massive audience growth and sharing. While Upworthy’s ascent to the top of the digital media landscape has been impressive, there are questions about its viability as a long-term media player. Pressure from competition—new and old—as well as an over-reliance on Facebook and the pressure to crank out a never-ending string of hit content have created a situation that demands continuous innovation to stay ahead of challengers. The question is, can it? There is no doubt that Upworthy’s fate remains squarely in Facebook’s hands. Their traffic and virality is provided in large part from the social giant. Is it a sustainable channel for the company? The answer to that lies, in part, with how Facebook views Upworthy and the content that spreads across its platform. Does Facebook view it as a symbiotic relationship, wherein Upworthy content drives engagement on Facebook, even while gaming the dynamics of their algorithms, or do the Facebook brass see it as parasitic? And if so, will they shut it down like many Facebook viral sensations before it? Facebook recently made changes to it’s news feed algorithm to adjust for the dearth of viral content. Some SEO’s have likened it to Google’s Panda update to quash content farms that plagued its index prior to the roll out. While Facebook denies that the reason is to combat viral publishers like Upworthy,  the sheer reliance and single point of failure for the business has to make platform dependence a concern for Upworthy and their investors. Unfortunately, Upworthy can’t just worry about itself in this regard. Because while Upworthy itself may not run afoul of platform rules, and hold themselves to a higher content standard, the proliferation of viral content and Upworthy clones may force Facebook to react holistically to restrict reach of this content to keep the News Feed from being polluted with link-baity video clips and images. In a true tragedy of the commons, these viral media companies may ultimately be the victim of their own success if Facebook decides that the core product value and user experience is being infringed upon. This doesn’t have to be a swift death. Facebook doesn’t need to use the nuclear option of banning these services to wreak havoc on Upworthy’s growth. Even a subtle tweak to the visibility of this content on Facebook would have massive implications for Upworthy’s sustainable growth and success. The imperative to diversify is clear. It remains to be seen how Upworthy will respond. Will they go the Zynga route and focus more on their own platform? Find other viral channels with scale? Or some other distribution model? Whatever the answer, it's not likely another social network. The company readily admits that Twitter, even on its best days, provides little more than a blip on the radar for their overall traffic numbers. Pinterest, Tumblr and other also lack the sheer size necessary to support a 100M+ monthly unique audience. The key, for now, then, is a transition to mobile and global audiences. One critical distribution channel for Upworthy is mobile. The company has largely been a desktop play, with mobile historically counting for roughly a third of the site's traffic. In a Business Insider article in 2012, Pariser stated that they spend a good amount of time thinking about mobile, and it’s clear that over the last six months they’ve begun to execute on their mobile growth strategy. While the company has yet to share insights on exactly what it’s figured out from the mobile perspective, it’s clear that over the last few months they’ve applied the same rigor of testing and optimization to their mobile traffic. This optimization has led to an explosion of mobile traffic, overtaking desktop traffic in November of 2013. In July of 2013, mobile traffic represented approximately 40% of all Upworthy traffic. In November 2013 mobile comprises nearly 57% of unique visits. The question becomes, where does Upworthy’s mobile strategy go from here? The company doesn’t rely on native apps, instead using a slimmed down version of its website as mobile landing pages optimized for content on the go. As the platform looks to get away from a Facebook dependency, building out a large mobile network of readers across the mobile web and apps could provide it a traffic-driving user base that it truly owns. Upworthy's mobile efforts also dovetail into its international growth strategy. Like another company we’ve profiled, Snapchat, Upworthy derives most of its traffic and user base from the US. This reality makes international audiences another big growth opportunity for the company. With roughly 63% of traffic coming from the US market, there is a big upside for Upworthy if they crack the viral code around the world. It should come as little surprise that other English speaking countries are the places where Upworthy has the most traction, as language and cultures overlap enough to drive viral hits off the content that also resonates in the States. With just over 16% of traffic coming from the rest of the world, the question becomes whether Upworthy can adapt their curation and viral formula to find success in new cultures and languages? International expansion of the Upworthy team will be a core part of executing on that strategy. Native curators and copywriters will need to be hired in the countries where Upworthy hopes to grow in order to create the emotional and relevant content that sparks viral distribution. Without native teams, a disconnect in cultural values, language and other differences will limit the success of the Upworthy formula. An international expansion will cost money, and Upworthy, while VC backed, doesn’t have the kind of cash at the moment to launch a large number of international teams and offices. As of this writing, the company doesn’t have any international jobs posted on their employment page. Without the ability to tap new, global audiences Upworthy will find it difficult to fuel the audience growth that has brought them this far. It will be interesting to watch the company to see how they tackle this international opportunity and associated challenges. More core to the issue than the ability to execute on a mobile or international strategy is the simple—and incredibly scary query for those invested in the company—question of is the Upworthy media model defensible and sustainable or not? A recent article by Business Insider suggests that Upworthy couldn’t be faulted for being worried. A wave of new virally-driven media companies have cropped up in the wake of Upworthy’s success with their Facebook distribution and traffic driving strategy. These companies all take slightly different approaches to content, and none carry the social ethos of Upworthy, but they leverage the same mechanics and tap the same audiences—taking reach and growth from Upworthy in the process. As just one example, ViralNova, a fast-growing Upworthy clone, is racking up millions of pageviews—all powered by a single 20-something. And it’s not just upstarts that are testing the viral waters. Incumbents, like the Washington Post, are launching similar viral hit-driven properties as experiments. New media companies like Gawker and Buzzfeed are not resting on their laurels either, and have experts who drive millions of pageviews each month individually, tapping similar formulas for success. Those are just the domestic competitors too. One has to imagine the Samwer brothers aren’t too far behind here, either. With the success of Upworthy, Gawker, ViralNova and others, there is no doubt that more will try to leverage their tactics and channels to replicate and take some share from this traffic source. This competition will impact all players. The question is how? As an aside, the sheer amount of information available online to those who want to learn about the Upworthy recipe is overwhelming. One has to wonder whether Upworthy’s willingness to share their secret sauce has, in some small way, fueled this proliferation and viral arms race. Traditional media sites have built brands and destinations that are visited regularly by people invested in those brands. The New York Times for instance, and even newer digital properties like the Gawker network, rely on brand loyalty to drive readership. Jalopnik readers are gearheads who get their car fix every day on the site. Same for Deadspin, Jezebel, and others. Will the same paradigm and brand loyalty exist for Upworthy? When the atomic unit of success is a fleeting piece of content, is there a brand loyalty that translates into sustainable business value? Or will the dollars and traffic flow to whomever has the flashiest content at the time? In other words, if viral content from Upworthy stops appearing in users’ Facebook feeds, will anyone care? If the answer is no, this poses a serious risk to sustainable growth for the company. Upworthy seems to be keenly aware of this issue, using each step of the Upworthy UX to not only prime the viral cycle, but to also capture and build audience assets for itself through email collection and amassing social fan bases. As we’ve seen in many examples (Fab, anyone? ), an email list does not make brand loyalty, and dependence on viral flashes of curated content that magically find their way to the audience doesn’t necessarily drive users to proactively seek out those moments. Do some people go to Upworthy to see what the latest viral hit might be? Absolutely. Is it a destination like YouTube or Buzzfeed? That would be a tough argument to make. And in a model that lives and dies on the ability of the channel to deliver content virally, the brand is beholden more to that channel than anything else. Without the channel, there is no brand. If Facebook chokes off viral content, if ViralNova produces a string of hits, will Upworthy’s email database save them? It doesn’t seem likely. One of the biggest challenges for media businesses in general is monetization. 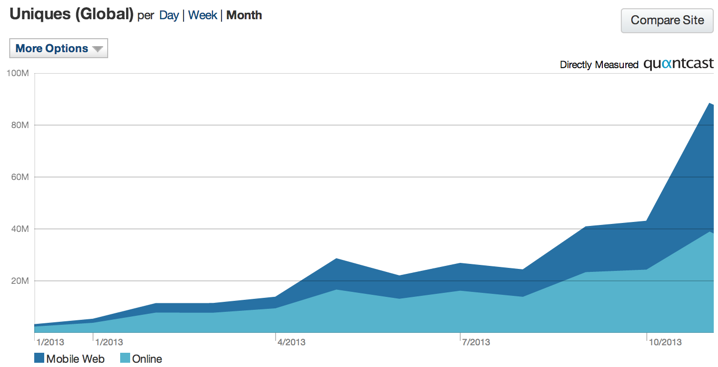 Like traffic, the Upworthy team has a different point of view than traditional media companies. As far as Pariser and Koechley are concerned, the ads that Upworthy runs should match the company’s values. Though Upworthy’s earliest ads, sponsored signups, were geared mostly toward nonprofits, as of this year they’ve branched out to include more corporate sponsorship as well. One example is the video If You Were Looking At The Beautiful Picture This Guy Is Looking At, You'd Have This Reaction Too, which features Denis, a man who left his family in Uganda to attend school in the US and for safety reasons can’t return. Denis keeps in touch with his family via Skype, the video’s sponsor. For this reason, not every business is going to be able to stamp its name on the kind of content Upworthy publishes. And while that higher purpose is well and good, is it sustainable as a long term growth driver? Can they keep this socially conscious position while satisfying the growth demands of a venture backed business? And will the lure of the mega ad dollars from the top global brands errode this stance? It’s hard to see how the company can find lasting growth without a more inclusive ad strategy that taps into potential revenue that is out there, looking for engaged audiences. It also remains to be seen how advertisers will view an investment in Upworthy, a company that doesn’t push pageviews, time on site, or other metrics that typically matter greatly to the ad buyers controlling multi-million dollar pocket books. Just like they’re rethinking advertising, Upworthy doesn’t necessarily subscribe to the commonly-held beliefs about pageviews. As of November, Upworthy had 188 million pageviews on 155.8 million visits—just a shade over 1.2 pages per visit. (Contrast that to the Gawker Media Network, averaging just under 2 pages per visit.) But, based on the company’s extensive testing, they believe that pageviews aren’t necessarily a metric that matters for them. So rather than struggling to keep people on their site, they rely on the ubiquity of Facebook as a distribution channel, “tricky” titles that compel people to click, and simple pages optimized for sharing—all of which pull visitors back to Upworthy again and again. Upworthy seems positioned well to take advantage of the shift from traditional ad buying metrics such as CPMs to more return-based measures tied to new native ad formats. The question is, how will they scale their ad inventory while remaining true to their core beliefs about content and advertiser relevance? Is Upworthy Building a Sustainable Growth Engine? That question remains unanswered. While Upworthy has serious challenges in front of it to build lasting, sustainable growth, their ability to hack Facebook, consumer psychology and the content distribution model is nothing short of impressive. Whether they can keep it going, translate it to new channels, audiences, and devices while building a lasting business remains to be seen. Will the company tap international markets to fuel the next wave of growth? Or will they get devoured by fast followers, international copycats, and incumbents who beat them at their own game? Will Facebook pull the plug? And if so, will Upworthy establish new, viable distribution channels in time, or fall victim to the social network’s whims like others before it. Of course, we don’t have a crystal ball, and can’t say for sure, but while viral doses of feel good content may make for a bright spot in the average Internet user’s day, does it mark the beginning of a new media model, or is their growth as ephemeral as that last video you watched—what was it called again? Let us know what you think. What risks threaten Upworthy’s growth? Will it become a media empire, or a company lost in the Facebook time capsule? I agree. Upworthy has improved on social content, but it's a crowded field. With Facebook in decline (at least in the long term), the media site's reliance on the social network might work against them. Either way, upworthy article. With part one of the Upworthy analysis we surveyed 165 readers about the biggest risk to Upworthy's growth. The top choice was "over-dependency on Facebook" chosen by 42.4% of all respondents. Nice piece by Morgan, pretty well covered. Looking from the company risk perspective, they face all the product risk, market risk and customer risk. It's really depending if they were able to mitigate the risk to hacking their next growth opportunity. Great article and awesome premonition.